We women of the CSM constituency, gathering rural and urban, fisher folks, peasants, pastoralists, indigenous, consumers, agricultural workers, NGO activists, landless women from all across the world, met during the CFS High Level Forum on women’s empowerment in the context of food security and nutrition, and developed the structure of our Vision Statement. This vision has been adopted by the CSM Women Constituency and aims to guide and promote the actions of the CSM within and outside the CFS to achieve the right to food for all women. We believe that the right to food, food security and nutrition and food sovereignty of women will never be achieved without ensuring the full respect, protection and fulfilment of women’s rights. We want to go beyond the universally agreed goal of gender equality and women’s empowerment, which does not explicitly assert the centrality of women’s rights. We also express some concern about the term “empowerment”, which might imply a top-down relation where women are conceived as recipients of external education, training, and interventions. We want to support our self-determination, autonomy and decision-making power in all the aspects of our lives, including the food we produce and consume. We recognize the need to deconstruct the dominant narrative on women who are very often portrayed as victims in need of anti-poverty policies and social assistance, and treated as objects in the food advertising and marketing industry. All actors engaged in the CFS must internalize in their analysis, contributions and practical actions the fact that women are active political subjects, agents of their own change and development, and must be recognized as having the right to self-determine themselves and their bodies. Women are knowledge bearers and have capacities, we require public policies that are gender-oriented or specific for women, with adequate budgets to guarantee their effective implementation. They should be primarily directed to women’s organizations, promoting self-empowerment, self-training and women’s autonomy. This perspective should inform any discussion leading to CFS policy decisions as these can be conducive to change or perpetuate the violence against women by hierarchical and discriminatory power that is historically and socially constructed, and normalized. We believe that the current global food system builds on and perpetuates gender based discrimination and the violation of women’s rights. 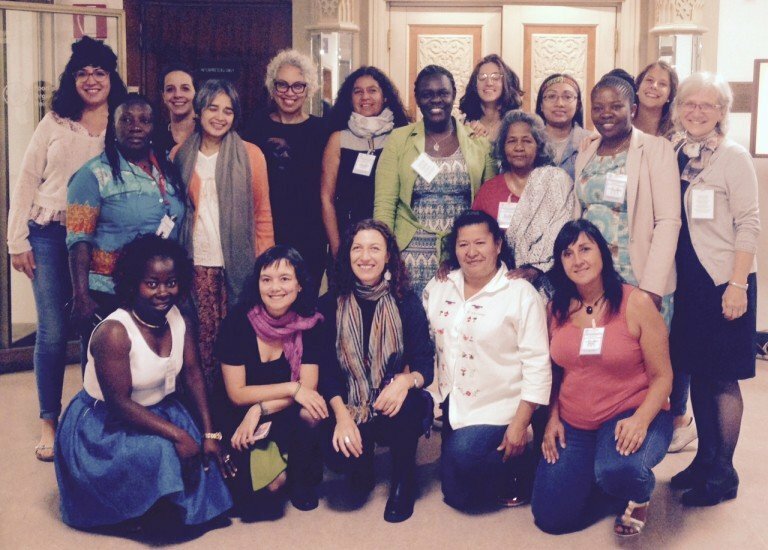 In order to achieve a fair and equal society where women can fully enjoy their rights, we must put at the centre the alternative model of consumption and production that ensure women’s rights, recognize their central role and that it is founded on agroecology and the food sovereignty paradigm. We recognize the CEDAW and the GR 34 as the UN global framework for the human rights of women, and we want the CFS to found any CFS policy decision on the women’s rights as embedded in the Convention, and to promote monitoring and accountability of the CFS policy decisions from the women’s rights perspective. The GR 34, which articulates the rights of rural women, should particularly guide the CFS with regard women’s rights in rural areas. to recognize first and foremost women as human being with their own rights including their sexual and reproductive health (SRHR), and not just in their role of mothers, care givers, responsible for the food security and nutrition of the households and the others. to address the root causes of food insecurity and malnutrition that are interlinked with patriarchy, feudalism and expanding industrial agricultural initiated with the Green Revolution policies in the 1960. With the onslaught of the neoliberal model, further exploitative and oppressive manifestations are unfolding such as the land grabbing of natural resources and women’s bodies, the devastating impact of big infrastructure projects, privatization, trade liberalization and deregulation. to pay special attention to women’s struggles and the impact of crisis, war and occupation over their rights, the criminalization of women leaders and human rights defenders, and the challenges faced by migrant and refugee women. to urge governments to implement what they have agreed to in international and global fora (e.g. CEDAW). Denouncing the fact that we are not missing normative policy framework to ensure women’s rights, but the political will to implement them. to ensure that the CFS builds its work on the existing normative tools as CEDAW and GR 34 and to strongly work on the use and application of its own policy outcomes.